John Eldridge in his book The Sacred Romance says that deep inside of us is a longing for intimacy and adventure. Here in Hebrews 11, we definitely see both! The intimacy is with a God who spoke us into existence and now can be trusted to care for us every step of the way (we will see this again in Heb 12). And the adventure...oh my! We are part of something bigger than ourselves...and that's exciting! We are in the "race of faith" with a long line of "runners"...some famous, like Abraham and Moses; some infamous and unlikely, like Rahab and Samson; and some unknown, like those who were sawn in two (among other horrors)...people "of whom the world is not worthy," the writer to the Hebrews says (Hebrews 11:38). What is it enables us to endure, like our fellow runners? It's faith! Not the world's kind of faith, which makes faith a work, or a "name it and claim it," or an "entity" in myself that I need to muster up enough of to get what I want. NO! As Andrew Murray says, "faith is confessed helplessness, casting itself on God [the living God, the "I Am"] and His promises [which are 'yes and amen!']." So the nature of true, Biblical faith has to do with the unseen and the future. It is confidence in what we don't see: God & His promises; not in what we do see: circumstances, people, things, feelings, etc. And the outcome of faith is that it puts "a smile on God's face"...it pleases Him. He puts His stamp of approval on us! 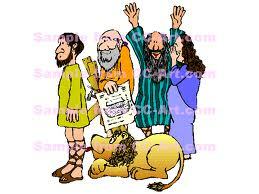 In fact, He so loves to see faith that He witnesses to it in us...He testifies to it in His children. Remember how God boasted of Job? "Have you observed my servant Job?" That's what God does when He sees true faith! So this means that God is looking for faith, not perfection! And that is good news to those of us who worship at the altar of "doing the right thing" or "doing it perfectly." It may sound so right to be trying so hard to be perfect or get it right, but where is God in that picture? That sounds more like self-effort and a "works with a smidge of God" type spirituality. 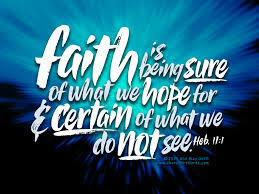 As you reflect on these far-from-perfect-people in Hebrews 11, thank God that, despite your "fluctuations of body and soul," you can walk by faith TODAY, because HE IS and He rewards those who seek HIM...step by step...by faith! Hebrews 11: We are Part of Something Bigger than Ourselves!